A home movie filmed at the July 7, 1937, All-Star Game at Griffith Stadium in Washington, D.C., captures incredible rare footage of President Franklin Delano Roosevelt walking in his braces. This is only the second known film recording the painful walk Roosevelt taught himself after he was paralyzed from the waist down by polio in 1921. The other clip is four seconds long; this one is eight seconds long. 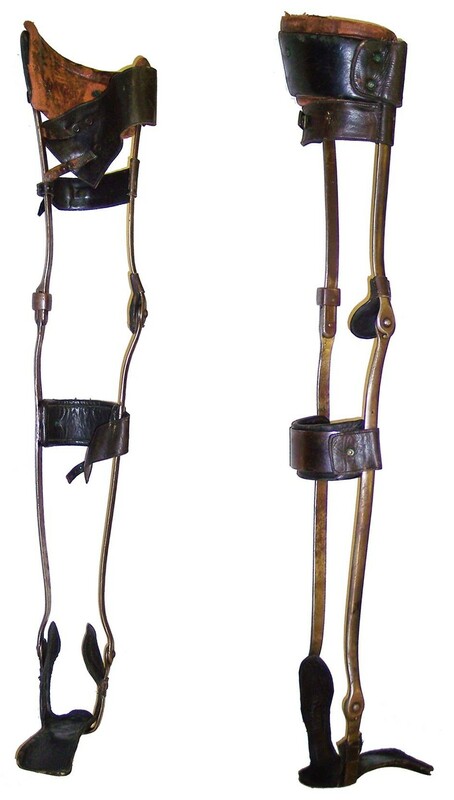 Determined to have a political career despite his paralysis, FDR had himself fitted with heavy leather and steel leg braces that locked at the knees and learned to approximate a walk by twisting his torso while using a cane for balance. With his other hand he leaned on aide or his son for support. This was an incredibly arduous and painful process and he couldn’t sustain the motion for very long. It’s a testament to his tremendous will power and upper body strength that he could do it at all. The footage was shot by Jimmie DeShong, who, as a pitcher for the Washington Senators, had close-up access to the field and bullpen even though he wasn’t actually on the American League team for the All-Star game, a team that included seven future Hall-of-Famers — Lou Gehrig, Joe DiMaggio, Earl Averill, Joe Cronin, Bill Dickey, Charlie Gehringer, Lefty Gomez — and was managed by another — legendary Yankees manager Joe McCarthy. A native of Harrisburg, Pennsylvania, DeShong recorded the day’s events with his 8mm home movie camera. The rest of the film captures private family moments and hunting scenes in Pennsylvania. It has remained in the family all these years. Jimmie DeShong died in 1993. It’s his daughter Judith Savastio who donated the film to the Pennsylvania State Archives so their experts could conserve it, transfer it to HD and make this important document available to the public. Documentary filmmaker Ken Burns is the first to benefit from this generous gift. His latest series The Roosevelts: An Intimate History was already complete when he heard about the newly-discovered footage. He found it so compelling that he asked PBS to let them re-edit an episode to include the clip. Any film of [FDR] struggling to get from one place to another is extremely rare, as the Secret Service either prohibited or confiscated cameras whenever FDR was making an attempt to propel himself from his car to anywhere else. The President wanted to minimize the public’s knowledge of the devastating effects polio had had on him – he was completely paralyzed from the waist down and he could not walk without the aid of a cane and braces on both legs. The press in those days complied with his request not to be filmed. We thought we had found and used all the rare bits and pieces that existed. But this remarkable 8 seconds provided to us by the Pennsylvania State Archives is one of the very best pieces of film that so clearly shows what a brave struggle it was for FDR to move. The fact that he is on an incline and that it is very windy makes his walking even more arduous. The wind even presses his pants against his withered legs and you can clearly see the braces underneath. The series will air on PBS starting September 14, 2014. Here’s the DeShong film, with Roosevelt’s appearance starting at the 40 second mark when his car is driven onto the field. 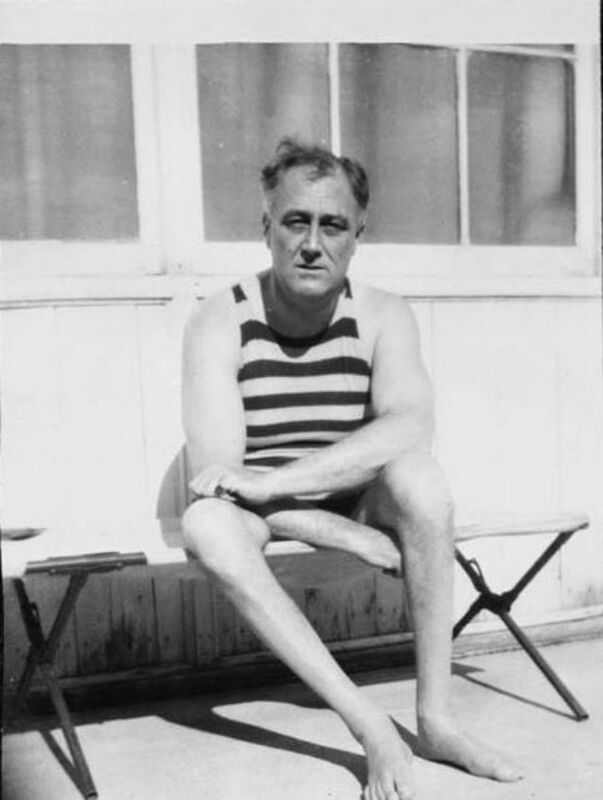 If you’re interested in President Roosevelt’s life after polio, make your way to Warm Springs, Georgia, where FDR did hydrotherapy from 1924 until his death in 1945. He bought an extensive property there and donated it to the Warm Springs Foundation, the non-profit organization he founded that would become the March of Dimes. For years the hospital in Warm Springs was the only one dedicated solely to the treatment of polio victims. The historic springs have been restored and although the waters no longer the fill the pools, the on-site museum bears witness to an illness that terrified a nation for decades until Salk’s vaccination was released in 1955. The Little White House, a lovely cottage he built next to the therapeutic warm water baths, is where he died. It’s a National Historic Site with a small but captivating museum in beautiful, peaceful surroundings. Very much worth a visit. This entry was posted on Sunday, May 25th, 2014 at 11:35 PM	and is filed under Modern(ish), Multimedia. You can follow any responses to this entry through the RSS 2.0 feed. You can skip to the end and leave a response. Pinging is currently not allowed. They didn’t try very hard to identify players. Two Cincinnati Reds were on the roster, and, based on their Wikipedia pictures, they looked very different. Based on nose and ears alone, the guy we see for several seconds at 4:09 has to be Lee Grissom, who Wikipedia tells me would strike out Lou Gehrig in the game. I don’t see anyone that looks like Ernie Lombardi in the video. The guy at 3:13 doesn’t really look like either of them, and also has on a different jersey shirt (with the “Reds” logo instead of the “C”, so I’m guessing he might have been a coach of some sort? Also, people had the BEST nicknames back then.